I first encountered Nick Kosevich’s cocktails back in the days when he tended bar at Town Talk in south Minneapolis. (In fact, it was Kosevich’s Sidecar that inspired my first Cold Glass article in 2009.) His back bar was lined with dropper bottles and dashers, evidence of his fascination with tinctures, bitters and flavorings. The original Town Talk is long gone, but Kosevich is still designing cocktails at another local tavern, Eat Street Social. He’s still designing bitters, too—cocktail lovers outside the Twin Cities may be more familiar with Kosevich and fellow Eat Street bartender Ira Koplowitz as the producers of Bittercube Bitters. Speaking of which, I’m a Bittercube fan, so I got all wide-eyed on my first visit to Eat Street when I saw something called “Trinity Bitters” in the cocktail list. I was absolutely certain there is nothing by that name in Bittercube’s catalog, and inquired if this was something new. It turns out that Trinity is a blend of three of Bittercube’s standard bitters. At the risk of sounding like a shill for Bittercube, I will guarantee this blend is an absolutely delicious addition to whiskey cocktails. The Trinity flavor is initially dominated by the orange, then the bite of the cherry bark, then vanilla, then herbal and floral flavors my taste isn’t subtle enough to identify. If I were to compare it to, say, the traditional Angostura, I would say it is more citrusy (particularly orange peel, and maybe grapefruit), more floral, less herbal, and slightly less aggressive, less “barky,” overall. 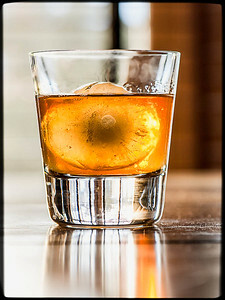 Eat Street uses the Trinity mix primarily in their very popular “Of the Older Fashion,” which is their riff on the original Whiskey Old-Fashioned cocktail. Stir ingredients with ice until well chilled; strain into an Old Fashioned glass or rocks glass containing one large ice cube. Express and garnish with orange. The Old Weller 107 is a brilliant choice for the Older Fashion; despite its elevated proof, it has a caramelly sweetness that blends very smoothly with the dark sugar and the bitters blend. As Eat Street serves it, Of the Older Fashion has striking sweetness—not so sweet that I don’t want to drink it, but noticeably sweeter than I prefer when I’m making it at home. I’m thinking they may be using a richer syrup than my usual 1:1, or perhaps its something about their Muscovado compared to my Demerara syrup. If you make your cocktails with rich syrups, you may want to cut that quarter ounce back a bit in this drink. As for the bitters, I’m blessed with a dasher bottle, so I can mix up little batches of the Trinity blend as needed. As it happens, the Bittercube bitters come in bottles with droppers, so you can easily substitute a full dropper of the Cherry Bark Vanilla and half a dropper each of the Orange and Bolivar. It’s a little more detail work, but it works just fine—and you can adjust the bitters blend to your own liking on the fly. This combination is far and away the best Old-Fashioned I’ve had in a long time. So good, in fact, that I’m thinking I’ll set aside the traditional Mint Julep for tomorrow’s Kentucky Derby, and cheer my favorite pony with Of the Older Fashion in hand. 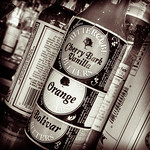 “Trinity Bitters and the Older Fashioned Cocktail” at cold-glass.com : All text and photos © 2013 Douglas M. Ford. All rights reserved. Your description of the bitters is intriguing. This cocktail sounds yummy. I like the large ice cubes, too. There’s only one thing to do: give it a try. You correctly surmised that your use of Demerara over Muscovado syrup is indeed the reason for the difference in sweetness. I’m surprised, however, that you didn’t also mention the stark difference in flavor between the two. Muscovado is an extremely rich, molasses-like (in aroma and flavor) sugar that is bound to provide a different profile. Thanks for your post on this cocktail, though! I’ve been at it (both at home and at Eat Street) for the last year, and can’t get enough of it! I’m glad you noted that difference here, Mark, thanks. 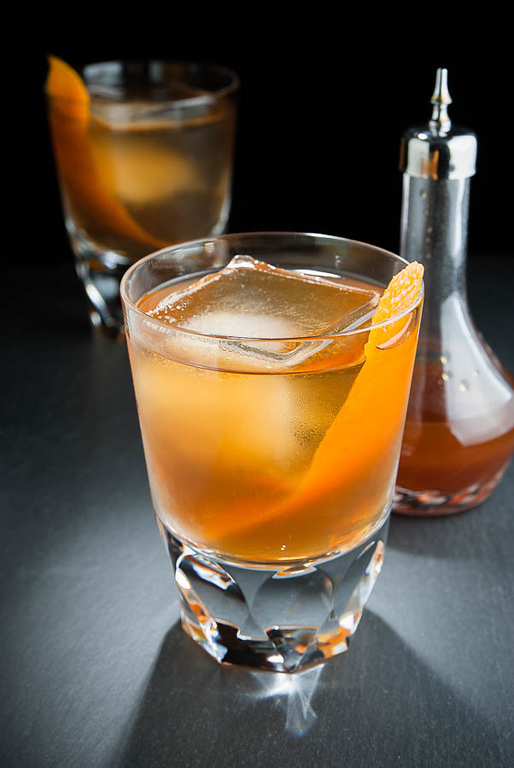 And here’s to the Older Fashioned!